For many years Bright was one of our sponsored children at the Oxford School. Seven years ago he disappeared from the school and didn’t come back again. One of the staff at Baobab went to his village to find out what was wrong. What he found there left him speechless. Mr Alhaji and I went there. Bright was there but could only walk with great pain. His older brother, George, was sitting on the floor of a mud hut and Collins, who was then twelve years old, crawled towards us. Alhaji and I had to first go for a little walk outside because we were moved to tears. Meanwhile, their mother and grandmother were called and we sat down together. The grandmother explained that there were four children who all had the same illness. Four year old Linda had already started stumbling. They had never seen a doctor because they couldn’t afford it. George and Collins, who at that time were no longer able to walk, didn’t have wheelchairs either. We took action. 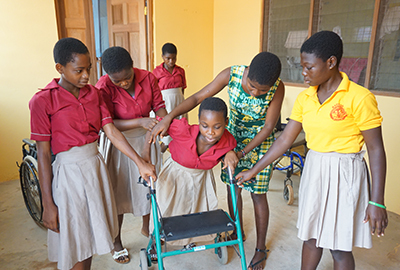 A hospital in Accra, a physiotherapist in Cape Coast, a wheelchair for George – we did everything we could think of. Diagnosis – Muscular Dystrophy. Incurable. After one year George died. Maybe George would’ve died anyway but he fell out of his wheelchair and banged his head. Three times he was rushed to the hospital in Accra in an ambulance because Cape Coast Hospital was overcrowded. He was the one who was best able to cope with his illness and accepted his fate. He was a rapper who wrote beautiful songs advising the adults to look after their children and warning his father to care for his wife and children and not go chasing after other women. We brought Bright and Collins straight to the Baobab School. Since then Bright has graduated and is concentrating on his art. Actually his painting is very good. 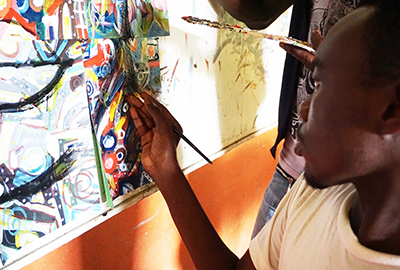 Painting strengthens him and gives him confidence so that he is now coping well, despite his illness. Sometimes he also teaches at the school which he enjoys. Collins will be next to finish school. Already he can walk again and is able to go short stretches without his wheelchair. We don’t see the same confidence and planning for the future that we see with Bright but he is ok and he is alive. Since the beginning of 2017, Linda has also been at the school. She is very happy to be with us and her brothers. She is a radiant young lady who is now learning to sew and after just one year is progressing well. She has friends who push her in her wheelchair and she knows exactly what she wants and doesn’t want. 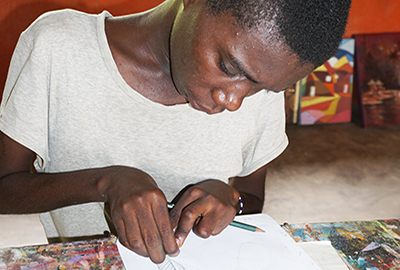 Bright, although he has finished school, isn’t able to go back to live in his village and is dependent on the support of other students. Probably Collins and Linda will have to stay with us too. Muscular Dystrophy is incurable. We can only be there for them, teach them and educate them so that they have as dignified a life and possible as long as they are here.